Christophe, from France, has a background in project management and teaching, before embracing the vegan culinary world. Having worked as an executive chef and consultant, he is also the author of countless recipe books on plant-based cuisine. He is the steady foundation of the learning center. Christophe, a passionate trail runner, specializes in plant-based cuisine for active people. He always has great stories and kitchen tips up his sleeve to share. 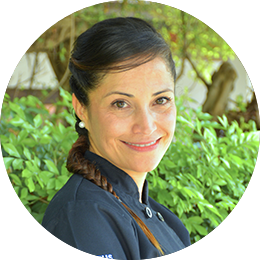 Our instructor Laura, who is from Colombia, has more than 16 years of experience in the restaurant industry and loves experimenting with plant-based cuisine. Laura is a free spirit who is truly passionate about cooking and baking and has been traveling around the globe for the love of food. If you walk into Laura ́s kitchen you will know she is around because of the smell of baked goods she is testing! Ivor, our instructor, is from Croatia. He worked in raw food and has been on a plant-based diet for 4 years.Because of his curiosity and experience in Nutrition, he’s bringing an interesting nutritional expertise to the culinary approach of Blue Lotus. You will recognize him by the notebook he carries around with his written poetry. We are sure that you’ll be inspired to ask him questions about everything you want to know on healthy plant-based lifestyle. Our instructor Ivana comes from Croatia. Her explorative nature and active lifestyle keeps her spirit alive. So after a MA in Criminology, she changed her path for plant-based nutrition studies to follow her passion for healthy eating and active lifestyle. She is an active vegan in Croatia where she started to work as a plant-based chef. Now she keeps exploring, experimenting and enjoying the fruits of Thailand. She uses superpowers to communicate her positive energy and shares new ideas, insights and food stories by teaching. Keng is our Thai instructor, an expert in traditional cuisine from Thailand, who contributed to the development of our Green Thai courses. Dedicated, meticulous and passionate about the art of food styling, he is always keen on sharing his experience and knowledge with students. Nawini (Pla), our coordinator passionate about food and travel, has many years of event planning and team management experience. Thanks to her charisma, positive approach and “can do” attitude she will always make sure that you enjoy the best learning experience possible and have a memorable time with us in the land of smiles. Passionate about cooking and trying new foods, Khun Kruawan, Assistant Instructor, has been in the restaurant industry for most of her career. With Evason Hua Hin resort for over 10 years, she was the junior sous chef of Coast restaurant, specializing in Mediterranean cuisine, before joining the Blue Lotus team. Known by her colleagues to be a generous, kind and fun spirit, she is always keen to share her knowledge and cooking tips! Our cook helper, Earth has a great knowledge about edible plants from Thailand and is inventive in his cooking. During a class, he is attentive to the needs of the students, always with a smiling face and gentle nature.